I think it may end with the soft click of a selfie stick. Wednesday, May 6th, I awake, unplanned at 6:05am. As a retiree I’ve grown accustomed to sleeping in later than that, but instinctively I know why my sleep has ended. 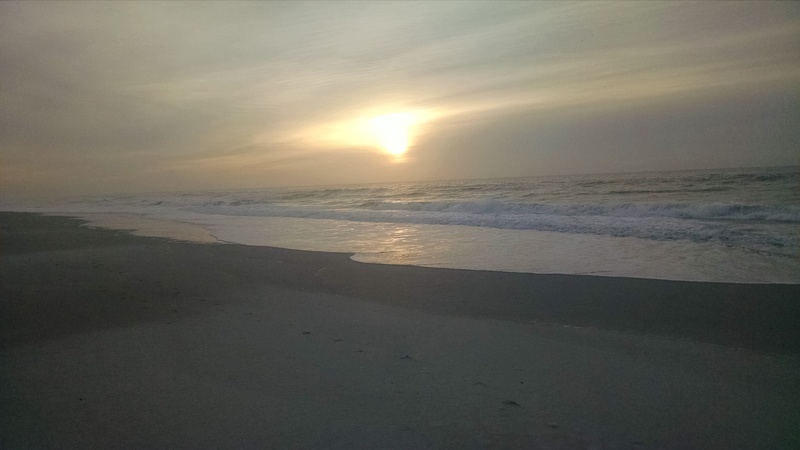 My mind knows that in just a few minutes a glorious sunrise over the early morning surf will happen no more than 50 yards down a grassy path from the hotel suite I am staying in at Wrightsville Beach in North Carolina. Now, I do live in Rhode Island, called the Ocean State, but my home is about 40 minutes from the shore, so viewings of sunrises over the Atlantic Ocean there require some planning. Quickly, I throw on a pair of shorts and a light jacket, moving quietly to not disturb my wife, daughter and grandchildren who are still soundly asleep in the suite, and I head out to the beach. My timing is good, there is the soft, reluctant light of early morning which portends the upcoming sunrise. Looking east over the curling, grey waves I see there are a few wispy clouds above the horizon. Perfect, as these types of clouds usually provide beautiful bands of gold, pink and blue when the sun makes its first slow, seemingly reluctant appearance. The shore is sparsely populated, but I spot a group of four young women, about college aged, posing with their feet in the shallow surf of the incoming tide. One of them snaps her phone onto the end of a long selfie stick and wide smiles appear. I watch them for a few moments. My problem is that in order to take the photo they all have their backs to the impending sunrise. I grumpily conclude that to this generation capturing themselves is more important than witnessing the actual sunrise! I’m 68 years old and I try really hard to have an internal curmudgeon meter to warn me against becoming a sour faced senior citizen. Sometimes, in moments like this sunrise morning, my meter fails to register. It also doesn’t always work when I see about 30% of the folks at Fenway Park staring at their text messages while the pitcher throws a curveball on a 3/2 count with the bases loaded! Or the curmudgeon meter doesn’t click on when I watch a family of five eating in a restaurant in stone cold silence while they all thumb the keypads of their personal devices! Now, I don’t think I’m a technophobe. I own, and use, my Apple Mini-Mac, my AirPad6, and my Android phone, but I have a growing concern that all those recent science fiction movies of machines taking over the world are becoming more documentaries than works of fiction. What I truly fear is the diminishing of real human companionship. But, wait, what’s that slight buzzing sound I hear as I stand here watching the sun make its glorious, golden appearance over the Atlantic? I do believe my curmudgeon monitor is working. Just in time the young women to my right turn around and gleefully greet the sunrise with youthful applause and and joyful kicks at the surf. I finally recognize that they had the sense of joie de vivre to come down to the sea at this ungodly hour to enjoy the nature show even with the likely burden of a prior night’s Cinco de Mayo celebration. Maybe this somewhat, by definition, self involved selfie is just their way of spreading the joy. Perhaps the soft click of the selfie stick is not, as R.E.M. sings, “..the end of the world as we know it”, but the beginnings of this new generation’s new adventures. Funny how one sunrise can flip so many perceptions. I’m glad I woke up early.